Copyright © 2003, 2018 Family hotel Zodiac, All rights reserved. The traditions of icon-painting and woodcarving school are still living in Samokov. Descendants of all the old craftsmen live and work here - wood-carvers, icon-painters, potters, smiths, carpet producers, tapestry, glazed ceramics, glass staining, textile industry and others. 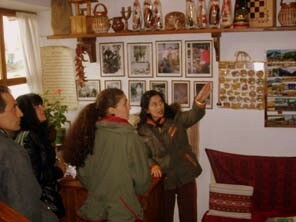 Organized visit of craft workshops, historical landmarks and churches in Samokov and its surroundings. The revival of old traditional crafts and techniques ikonopistta, carving, engraving and blacksmithing have dedicated many sabremennite artists in the city. Pottery: In the pottery workshop procreation master potter Raycho Savov demonstrate one of the oldest techniques for making pottery, using the potter's wheel. 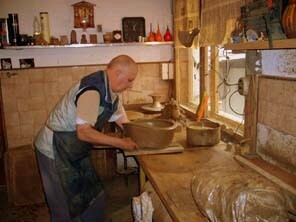 Parents of Raycho Savov moved to Samokov by Busentsi, Tran and carry the craft and skills, and Busenskata pottery was known not only in Bulgaria. Even today, the master and his family made pottery in old technologies busenskite masters. Carving: From generation to generation transmitted tradition of Samokov woodcarving school. The tree today guardians of the craft sculpt fine traditional embroideries. Iconography: iconography is the pride of Samokov since the eighteenth century. Hristo Dimitrov - Christon teacher, as they call it at that time was the founder of the Samokov School of Painting. His followers, the most significant of which is Zachary Zograf marked the supreme achievements of iconography and secular art. Today painters of Samokov also have their peaks. Coppersmith: She copper reminds warm sunny autumn. Caressing and soft when you touch her, you feel ready to change yourself. To become a jug or coffee pot, women's jewelry, accessories Book and church font. And you put it into your house, like suns Gray. Cutlery: The weapon has long been an attribute of the male nature. Embroidery and Knitting: Are cover will carpeted table, whether you sew clothing or jewelry bosom will be decorated, first the Bulgarian beauty adorned them. Picturesque courtyards and colorful meadows at home will bring.